The Minister of Tourism, Nikolina Angelkova, held a work meeting with Jason Wong, executive director of the research centre of the Global Tourism Economy Forum. The two converses during ITB Berlin –the most significant tourism forum worldwide – where Bulgariais presented with a national stand. Minister Angelkovapresented the Ministry events within the framework of the Bulgarian presidency of the EU Council. She informed Mr. Jason Wong about the outcomes from the council meeting of the ministers of tourism, which was held in Sofia in mid-February. The forum was attended by Elżbieta Bieńkowska, EU Commissioner for Single Market, Industry, Entrepreneurship and SME’s, Zurab Pololikashvili, Secretary General of UN’s World Tourism Organization, and over 500 delegates and guests. Minister Angelkovaindicated that the major topics of discussion included the 2018 EU-China Tourism Year initiative. The Chinese market’s potential is huge, in 2017 12.4 million visits of Chinese nationals were registered in the European country, an 18% growth compared to 2016, said the Minister. She noted that Bulgaria will be hosting the 7th summit meeting of state- and government leaders of the Central and Eastern European countries and China during the second half of 2018. The Minister advised that during the event the Chinese-Bulgarian tourism forum will also be held and offered co-organization to Mr. Jason Wong. Also discussed at the meeting was the cooperation potential with the southern Guangdong province, which has the highest gross domestic product per capita. Minister Angelkovafamiliarized her interlocutor with the preparations for the 2nd edition of the International Congress on World Civilizations and Ancient Routes in November this year and invited Mr. Jason Wong to attend the forum. The Minister indicated that her institution and the government are implementing a consistent policy to establish Bulgaria as a 4-season tourism destinationand promote our cultural-historical riches. 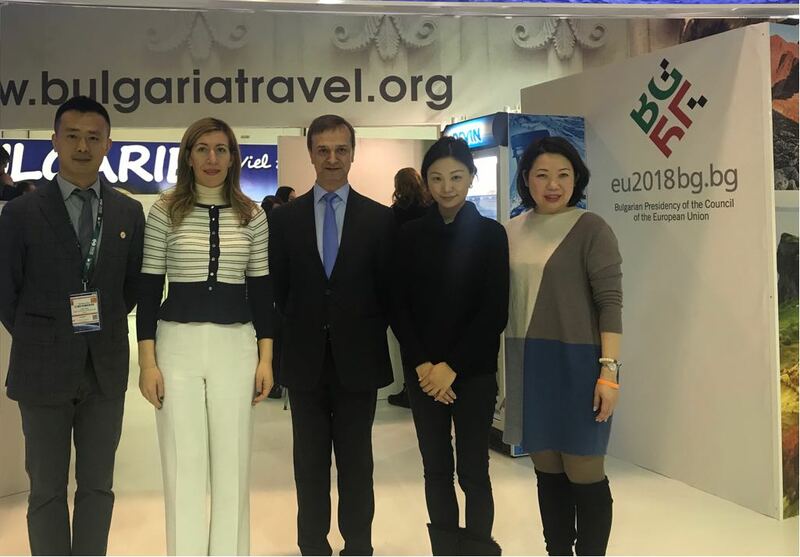 Mr. Jason Wong congratulated Minister Angelkovaon the hard work done to develop tourism in Bulgaria and indicated that the eventsscheduled for this year will have a positive effect in attracting more Chinese to Europe and Bulgaria. During ITB Berlin Minister Angelkovaalso held a work meeting with the Minister of Tourism of the Republic of Mauritius – Anil Gayan. Last yearthe total number of international visitors to Bulgaria was nearly 8.9 mil., which is 7.6 percent more than 2016. The 2017 revenues from international tourism in the country amount to BGN 6.895 billion, which is a 9.3% growth compared tothe hitherto record-breaking year 2016, said the Bulgarian minister. The two discussed options to expand cooperationin tourism, as well as the investment map, which contains 32 Bulgarian projects of potential interest to investors.